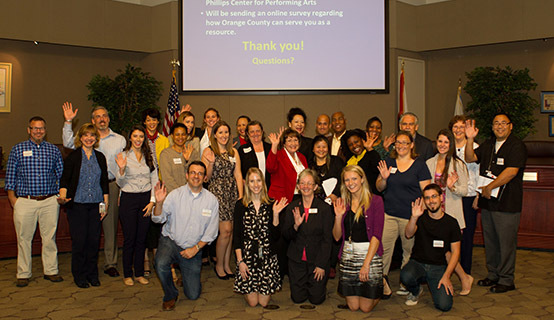 The Orange County Communications Division recently hosted representatives from more than 20 local community publications and online media outlets for an educational session and meet-and-greet with Mayor Teresa Jacobs at the Board of County Commissioners Chambers. Those attending the event learned more about the resources and information that communicators at the organization can provide to hyperlocal reporters and multimedia editors. Additionally, Public Information Officers from the divisions of Animal Services, Parks & Recreation, Neighborhood Preservation & Revitalization, Utilities, Environmental Protection and Corrections shared information about upcoming events and potential story ideas that impact local communities. Orange County is the fifth largest County in Florida with a 2014 Real Gross County Product of more than $70 billion. In fact, 11 states have Gross Product below Orange County. The region is also home to 13 cities and towns that have their own unique character – and there are more than 50 community papers in the area. Orange County has an annual budget of more than $3.4 million and is one of the largest employers in the region with almost 7,700 employees. Orange County Mayor Teresa Jacobs thanked the community papers for their continued support and dedication in covering important local issues. A collection of photos from the Community Meet-and-Greet is available for use by the media and are located on Flickr.